The show's recurring characters return, including a familiar apparition and a guy who says he's Seth Rogen. Then, Joel previews his new action series. Joel has fun with unsavory French television and an irate Scottish gardener. Anna Faris hosts an offbeat talk show with Joel and Eugenio Derbez. Bellamy Young gets jiggy with '90s slang and voting. Plus, more "Mini Black Mirror" and embarrassing moments from "Jersey Shore," "Jeopardy!" and UFC. 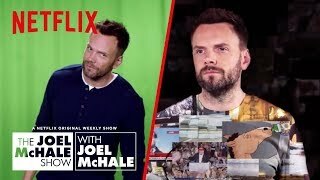 Currently you are able to watch "The Joel McHale Show with Joel McHale" streaming on Netflix.